Commemoration Medal will be delivered from first week of June. The ribbon is in the colours of the Regimental Stable Belt – Rose and Primrose. The Commemoration Medal is presented to all Regular and Reserve Fusiliers who are serving on the 23rd April 2018 to recognise the 50 years of service of the Royal Regiment of Fusiliers. In accordance with Chapter 13 of Army Dress Regulations, service personnel may only wear on uniform or in civilian clothes those Orders, decorations, medals, ribbons and emblems awarded to them, or approved for them to wear, by HM The Queen. 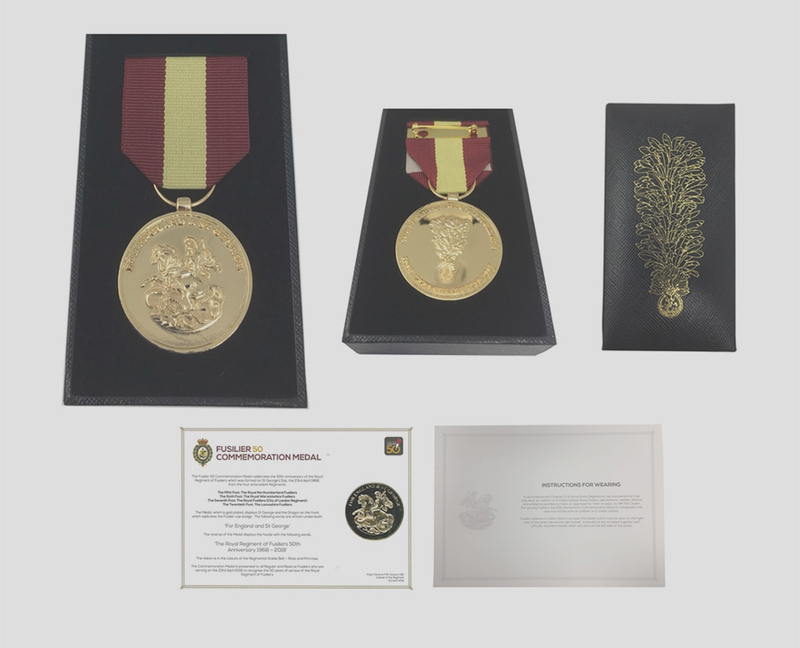 For serving Fusiliers, the 50th Anniversary Commemorative Medal is a keepsake only and may not be worn on uniform or in civilian clothes. Fusilier veterans in civilian attire may wear the medal, but it must be worn on the right side of the jacket above the right breast. It should not be mounted together with officially awarded medals, which are worn on the left side of the jacket. The cost is £22.99 but with the Fusilier Association Card you will receive a 10% discount.